With the regatta season winding down, racing tends to move towards the long-distance variety. And this year, a Northern alternative to the Boston Marathon was proposed for two intrepid / foolhardy members of Chesterton Rowing Club. Instead of a river race, this would be in the land of mythic monsters and crashing waves. Loch Ness. Fort Augustus to Dores. 22.7 miles. What was there not to like? Chasing the record set by the legendary Scot, World Champion sculler Peter Haining, but also simply as an exercise in survival and wave surfing (of which more below) and self-discovery. So, when Jonathan suggested we do it I was quick to agree. A boat was organised (a rather fabulous coastal double in, do our eyes deceive us, Chesterton blue) and we were in. It was only as we drove down from Inverness (it takes about an hour to drive the length of the Loch!) and saw the waves that serious concerns and a creeping sense of foreboding started to fill our heads. The acclimatisation paddle on the evening before was perfectly lovely and the loch surface was barely troubled by the gentlest of breezes. Conditions couldn’t get much better than that we thought. It was all going so well… Our heroes: Steven Andrews and Jonathan Pilgrim. The next morning, arriving at the launch site, the water was the like of which numerous locals hadn’t seem for some considerable while, a mirror-smooth surface that looked like one could see the reflection of the entire sky. In fact the only perturbation seemed to lie on the horizon where the horizon met the loch, a result of the length of the piece of water that lay ahead and the curvature of the earth. The start was admirably informal, with a nice assortment of river racing craft and more robust vessels. The first half was just lovely. The first quarter being amazing. Starting off on a glassy millpond the only concern was that it was quite a long way and at least one of the crew slightly resented pulling along such an impressively heavy boat. A strong start saw us only led by a racing quad and eight. After a quick pause to remove some layers of clothing, we rowed the rest of the way just in just our club all-in-one’s. Just warm enough for the sustained effort to keep us warm (2:20 to 2:30 split, for those who are interested). The second half was a different matter. Slowly but surely the waves started to get bigger and it started to get harder to figure out how to hold any kind of split. 2:30 was the aim but 2:40 And 2:20 would randomly pop up. And it just got rougher as was obvious when the eight appeared again in front of us, all of its crew looking rather bedraggled. We would eventually pass them as they were sinking, having gone the wrong way around a fish farm. By this stage my glutes were on fire (training, or even some Sculling in the last year may have helped that) and the waves meant that every now and then you would be rowing uphill. The effort leading to the occasional yelp of pain. Luckily this was balanced by the whoops of enjoyment as we surfed down the other side. 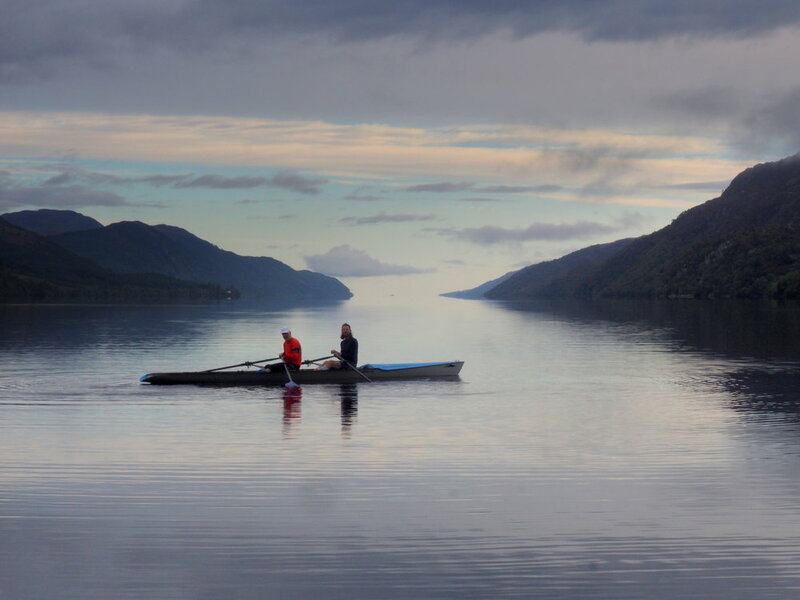 But what an amazing piece of water to row on, hemmed in by the steep sides of the great glen, a feature delineated by an ancient geological fault that splits Scotland in two, and the departure point slowly dipping below the horizon. Then there was just the finish to deal with. Trying to exit the boat in crashing waves and the potential to be smashed against some ill-placed rocks. We were very glad when Audrey, our fabulous bank party and photographer, jumped in to help. And that our legs didn't give way when we jumped out. Quite an effort to lift the boat out and on to trestles and then collapse. A well-earned beer followed and some fraternal banter with our fellow competitors. All in all, a really rather special event and there will certainly be another attempt from the Club. A rough day on the Tideway will never quite hold the same terror for these two club members. Video (see 1:14). More (9:45; actually a bit earlier you get to see the quad trying to land, which is fun). We had quite a few crews for the Nines Autumn Regatta. The draw is here. M1 were blessed with a straight final against Downing, which we duly lost. Young master Burgess started off well in the sculls but discovered that rowing upside down is slow. Old Mr Pilgrim won his first round “easily” but was then defeated by some youth from Magdalene. That suffices for the men, but wait there is rather more to be said on the women’s side. Chesterton Ladies had a very successful day yesterday will all 3 of our boats getting to their finals. We started off proceedings at 8:34 with our open coxed IV and finished at 17:45 with our Masters coxed IV. Our Ladies Masters Quad (Sarah C-H, Amanda, Meg and Katherine) had a bye to the final and were up against a very experienced Masters crew (composite of Peterborough and Leicester). Being a Master category above our ladies they also got a head start on the race, always making it difficult on such a short race to get them back. A very good row by our ladies! Our Open Ladies Coxed IV (Meg, Eleanor, Catherine, Sarah B, Rachel) were less fortunate and in a category of 5 crews and got the short straw with Gravesend as the first race on the river at 8:34. It was a beautiful morning and when finally on the river it was lovely! Winning the first race by just over a length. The second race was up against one of the two Peterborough crews in the early afternoon with a win of two and a half lengths. The other Peterborough crew was also knocked out by our next competition Darwin College. Probably our youngest competition of the day and we had seen them out training the week before. The final was our best race of the day but also our third and the Darwin crew were just a little longer and faster beating us by 1 3/4 lengths. Our Masters Coxed IV (Anne, Angela, Pamela, Renata, Kate) a different line up to the last year but still a very successful crew. Winning their Semi-Final against St Ives by 4 lengths (not sure when easily is put!) and coming back for the Final (one of the last races of the day) to take on Devils Elbow and taking home the pots by winning by 1 and a third lengths. Well Done Ladies, Renata's first pot with Chesterton and Anne's first coxing pot. Sunday 9 September dawned fine and sunny for 99s regatta. We had entered a Master’s C IV+ with Angela, Pamela, Renata, Kate and me coxing only my second regatta. 99s in their infinite wisdom, compelled all coxes to complete a totally time-wasting exercise of being weighed on Ditton Field, which is totally inconvenient if you are boating from town Surprise, surprise, I weighed more than 55Kg. Back now to the business of the race. We had only had one outing in this combination which had been scrappy to be polite. The 3 stalwarts of W2 insisted we had the same start as W2 in bumps which did at least avoid any discussion on that point. Bow pair needed to row together more evenly to stop any lurch to stroke side off the start – very scary for a cox. Out first opponents were St Ives. They didn’t look too intimidating in their row to the start. We actually got a 3 second advantage off the start as we were Masters C and they were youngsters at Masters B. I was relieved to get on the stake boat at my first attempt Remembered to keep my hand up until we were ready. Then we were off on the first go. 3,2,1, go. Then St Ives. And we kept nicely in front the whole way down the Reach. No sneaking up on us just when everyone gets a bit tired. Through to the final. Hooray. 5 hours later, we faced Devil’s Elbow, who were also Master’s C, and who we thought looked significantly younger than us. Must have been using their moisturiser. The start was much windier and our bows started floating off at 45 degrees from the stake boat. But eventually after the umpire had straightened us both up, and clearly enjoyed using his megaphone, we were both off. And steadily and consistently we slowly drew away. So long as no one caught a crab, I knew it was ours. And it was! It’s great to pass the finish line first. Pots and showing our BR cards – the ones we bring but don’t like to mention, in case we don’t need them. Sudbury (arch). Words by Rachel. A Chesterton contingent went to the 138th Sudbury International Regatta yesterday! I think it is fair to say we were mostly very scratchy crews. Thursday night saw the loading of Spare Rib and WGP onto the 99's trailer and Nostromo onto the Cantabs Trailer on Friday (kindly arranged by Conor). Saturday morning came with a bright and early start to arrive in Sudbury for 8:00am to grab a prime gazebo pitch and to get Nostromo ready for it's foray in division 1 at 9:00am against Lea RC. For those of you not familiar with Sudbury it is a narrow river and essentially side by side, like racing round grassy corner but with more weeds. There is nowhere to warm up other than your row to the start. The eights row 350 m (missing the very tight bend) and the fours row 650 m. There are many, many crashes though out the day - indeed 99's owe us a bow ball after they ploughed into the bank! The M4+ had a good and the only uneventful race of the day but unfortunately lost to Lea RC. The W8+ also against Lea RC raced at 10am in Div 3 - there was I think it is fair to say some regrettable umpiring/marshalling decisions made at the start and the staggered start did not really happen. Sadly this meant that Chesterton was pipped to the post by 2ft 😞. A very solid row and some beautiful rowing to showboat for their fans on the row up. I think we can honestly say they wuz robbed. Division 8 saw the Chesterton mixed "Power 8" row. This crew had never been in a boat together but on paper looked pretty good. 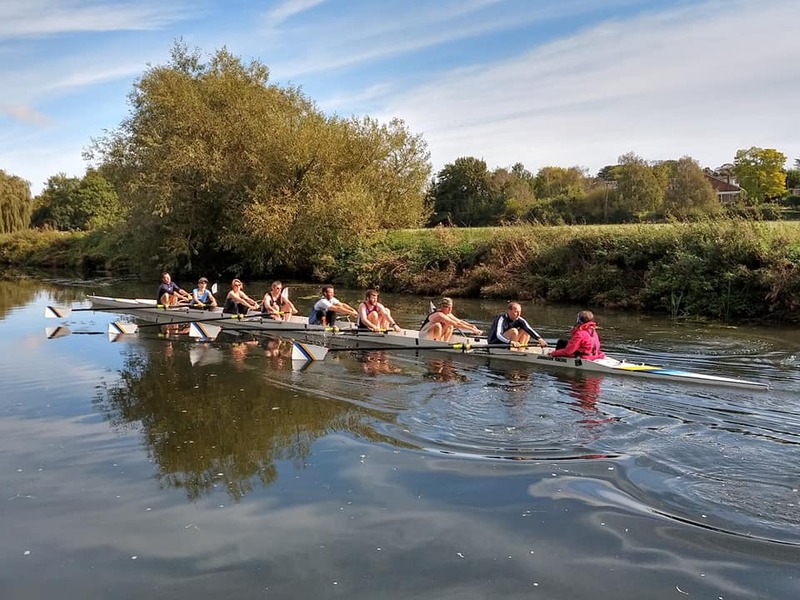 The row up felt good.....we were confident… Broxbourne went off first 1 sec ahead of us but I think that's where it went wrong - we mistimed our start and strokeside in their excitement overpowered bowside straight towards the reeds! 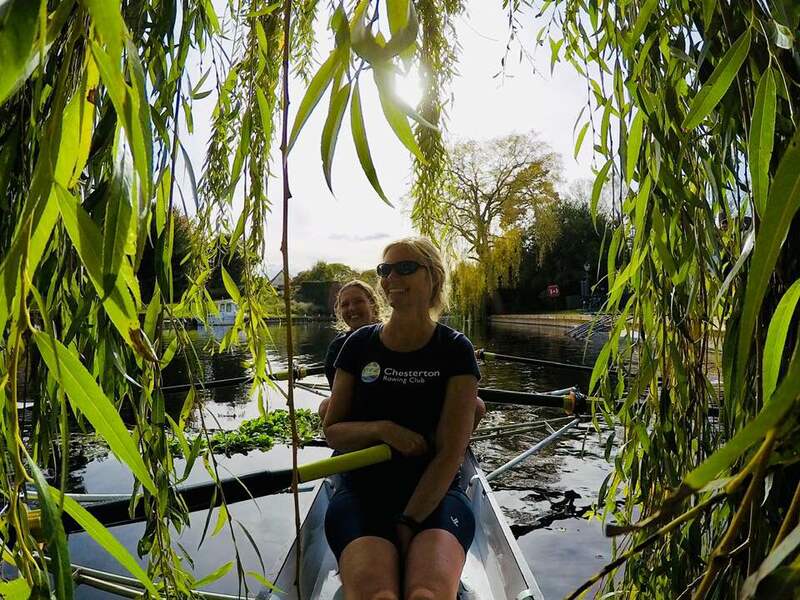 And the whole of bowside had to rapidly learn how to cross country row through the reeds (and the bank) but we emerged unscathed and powered down the rest of the course - if we'd had an extra 100 m I reckon we would have caught them! Jonathan then popped off to row with a Huntingdon / St Ives composite crew where they had a cracking row and made it to the final. Division 15 - W4+ masters B/C (straight final) - yet again we were up against Lea RC! After a lot of chaos at the start we were off with a 4 sec head start on Lea (being the older of the crews) on the apex of the bend Lea RC went wide crossing into our lane and colliding with our blades. The Umpire halted our race and called it "equal blame" even though the cox of Lea admitted it was her fault - we were offered a re-row. So off we went to the end of the course to wait for the next division. We waited our turn and began to row to the start - rapidly halted by Lea RC who now had no rudder! The umpire said they could not race (in fairness they didn't want to) so we rowed off to the start to race back alone! We had a lovely race back against the clock! And were happy with our time (and the shiny pots although it does feel a little bit of an empty win). Boats were rapidly put back on trailers and base camp packed up as it was now heading towards 6pm. One last race with a chance for Chesterton - Jonathan in the composite crew - I think it's fair to say the four remaining Chesterton fans cheered with all their might but it wasn't quite enough. Back to Cambridge for detrailering and re-rigging - the last boat got put away at 22:20 after some night rowing (four people in the eight and two people in the four) back from 99's to the CRA - (yes we had lights). The weary contingent went home! It's that time again; here's the start order. We have three men's and three women's crews this year, ranging from the usual been-rowing-all-year to the just-got-together-before-bumps. This year Chesterton is the "featured club" in the bumps programme. But blogs are so out of fashion; a succession of posts to fb is how most things got noticed; so well behind time I'll try to update this with results. And rather than day-by-day, how about crew-by-crew? Overall results (partial archive): M1: 0; M2: +4 (blades); M3: +3. W1: +2 (to 8, highest ever); W2: 0; W3: +2. * Day 1: M1: down to Tabs 3. M2: up on Champs 2; M3: up on Nines 7. W1: up on Robs! W2: Up on Nines 4; W3: row-over. * Day 2: M1: row-over; M2: up on City 7; M3: row-over. W1: row-over; W2: row-over; W3: up on Champs 6. * Day 3: M1: up on City 2; M2: up on Press 3; M3: up on Champs 5. W1: row-over; W2: down to City 5; W3: row-over. * Day 4: M1: row-over; M2: up on St Neots 2; M3: up on City 11. W1: up on City 2 (at last! ); W2: row-over; W3: up on City 8. Note: currently this is an archive-in-progress awaiting filling in. Notice subtle links to my and PH's posts. * Vidz: riggercam, day 3. JoC. riggercam, day 4. JoC. * Tabs 2 (Hills Road returners) day 2 versus Nines 2. * Vidz: JoC, day 4. * Vidz: JoC: day 4. * Vidz: JoC; day 3. Anne, Day 4. And for the Yellow, Blue and Blue. and the draw strokes you can do. Get us out from under, Wonder Women. And it’s magic that you do. You’re a wonder, Wonder Women. 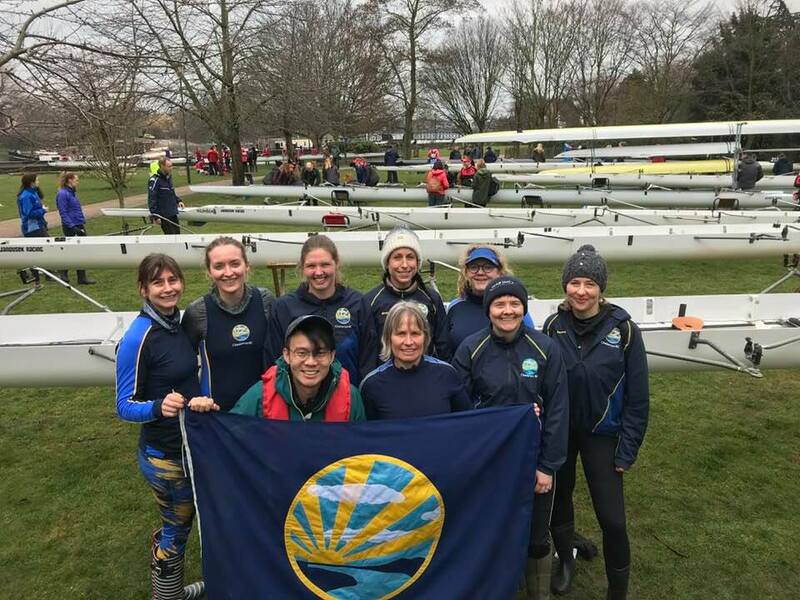 Chesterton W2 “Wonder Women” bumps crew 2018: Manja, Ella, Kate, Dawn, Pamela, Eszter, Masha, Angela (Captain), Caroline and supersubs Katie and Cecile, and Coach Seline. * 2017 day 1; day 2; day 3; day 4. * 2016 day 1 ("The day was hot but so were we. Woof! Is that an oar in my one-piece or am I pleased to see you?"). MeHoRR... like WeHoRR, only more manly. 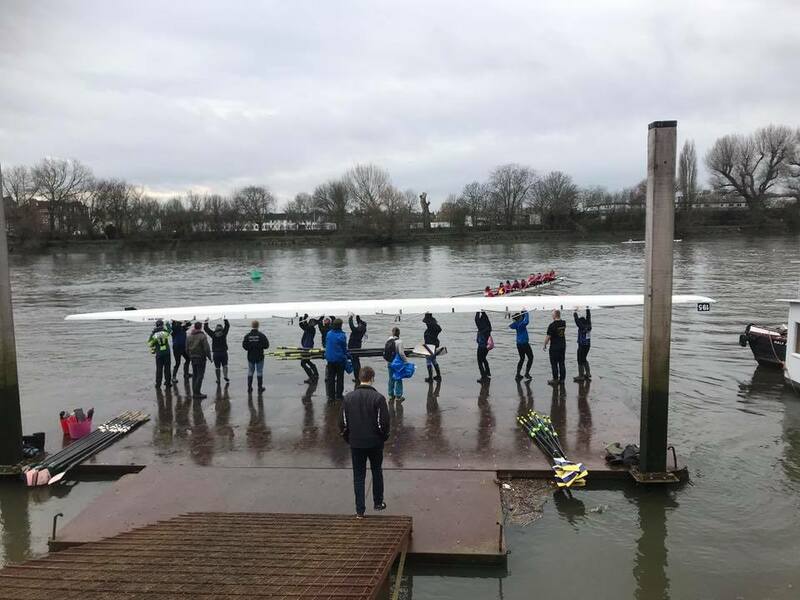 We men had, after an heroic training programme (strictly limiting ourselves to at most two outings a week) and a mad scramble for a sub (thanks to Scott-from-Essex) arrived on the sunny banks of the Thames to find the boat left for us by the ladies from yesterday. Everyone turned up, even a surprisingly unbloodied Steve P, and all was ready in time. Top tip: the queue for the loo is much shorter at AK than Furnival. TL; DR: 20:29, start 219 finish 183; three overtakes; a good row. Boating was uncontroversial, as was getting across the river and warming up and getting to our marshalling point. Except... where exactly was our marshalling point? We got somewhere, but it seemed empty, so we went further... and further... until a marshall told us we'd come too far. We needed to spin, go back, and re-park lower down. Which was fine, as we wanted to do some rowing with the stream anyway. A little later we did an impromptu 360 due to some rather unkind positioning by another crew, but then we all started moving up as the racing crews came down, and before you knew it we were above Chiswick waiting for our turn to spin... a few strokes down to the bridge to settle ourselves... and we're off. After that, we did 20:29 minutes of largely undifferentiated rowing, which is how it should be in a head race. Apparently 5 and 6 couldn't hear Keith because the middle speaker was broken, but that's fine, you don't need to hear the cox anyway :-). My GPS trace, and Steve P's, says we got a pretty good line except perhaps around the big bend - I bet it has a proper name, I'll call it the bend opposite Furnival - where we cut the corner a bit. We overtook three crews, which also called for a bit more push to squeeze past them, and had 221 coming for us on the finish line. After which comes the traditional "it's a bit further back to Furnival from here than I thought". Then de-rigging and splitting and a pint, and we're off back to the calmer waters of the Cam. Which reminds me: Wx today: pretty good really. Well, it wasn't cancelled, for one thing. No rain, some sun, little wind, perhaps a bit of a headwind but nothing to complain about. * A truely fascinating video of us taking the boat out at Furnival and de-rigging it, in case you wonder what Funival looks like. Conor pulled out all the Cambridge crews. We didn't beat Pembroke or Tabs 1 or Nines first crew... well, you get the idea. But we were only a second behind Nines 2, and Robs; and we beat Jesus and Queens and Kings and Peterhouse. Out technique is of course by no means perfect, but actually it is pretty good. As Steve P and I agreed amongst ourselves afterwards. We are now - in fact we have been for some time - at the stage where we're fairly well jelled together, and know each others styles, and can work within that. What we aren't - and I'm leading the charge here - is strong enough. Senior 8: Rachel Newby, Natalie Andrews, Keith Lee, Sarah Hadman-Back, Eleanor Gordon, Megan Richards, Angela Barkes, Hannah Parish and Pamela Baxter. Alarm going off at 4:45 am, jumping out of bed to get to the train with everyone by 5:45 am - so early! Even with 45 minute delay to the start we wanted to be relaxed ready for boating! Boats ready, blades taken down to the boating area, nuts tightened, safety check complete - we were ready!! Time to go, navigating Furnival gardens; boats, bags, lamp posts, benches, challenge safely navigated. Furnival ramp; safely navigated with the support of our host BC, phew!!! Quickly getting in the boat blades out, Keith in, we were off! First tideway challenge: get away from the town boats, miss the green buoy and get to the other side with the stream going the other way - Done, success, breathe! Race warm up, front stops build, practising our race calls all went to plan - we were ready! First marshalling stage, luckily we had loads of space to navigate up and down with lots of tapping from the whole crew. Next marshalling stage a little closer, overlapping with jostling but safely done! Turning into the racing line and stream expertly done by Keith and we were set. Strong start off we went setting our rhythm which felt long, strong and sustained. Apart from some sharp calls from stroke to cox to “get in the stream, don’t cut corners” (sorry Keith)! The rhythm and calls were great and felt strong until Hammersmith. We’d made some space from the boat behind and it seemed like nothing going on ahead. Until suddenly Keith was shouting move to your...something (I can’t remember), then the umpire got involved. Luckily they moved and gave us space to overtake. Then we hit the wind after Hammersmith into the finish. The hardest 1k, but after some good calls from Keith and stroke shouting ‘Loonng’ we got it together and drove through the wind to the finish. Having some of our best rowing back and cheering on the Novice ladies as they came around Hammersmith. Evelyn Donnaes, Dawn Hawkins, Masha Netchaeva, Rosa Mottershead, Dave Richards, Kate Winter, Caroline Coetzee, Hannah Telka, Katie Bolt. While waiting at the train station on the morning of the race, it transpired that most of us hadn't managed to get much sleep the night before, which was somewhat reassuring to know so as not to feel the odd one out. The train and tube journey to the Furnival went smoothly without a hitch (bar a moment of tension going past the Piccadilly Circus without stopping and hearing "Please leave the station immediately" announcements). The weather looked promising, the river wide and calm, Furnival Gardens busy with fellow rowers assembling the boats. I must say I've found all this rigging and de-rigging equally fun (I guess until the novelty wears off), and it was a revelation to learn that the actual boat comes apart in halves. An hour and a half waiting before putting the boat on the water was spent calculating how many times one could go to the loo taking into account the length and speed of the queues, how many layers to keep/take off, how much water to drink, and fretting about taking the boat down a steep and scary ramp whilst being circumnavigated by runners, cyclists, families with prams and other members of the general public on a busy Saturday morning Thames embankment. And finally off we went. Usually the worst part of any race is sitting around and waiting for ages whilst getting cold and anxious. Here, it felt nothing like - time for a short practice, some steady state rowing, de-kitting/re-kitting, watching the crews racing past - all while generally feeling safe and secure under Dave's composed and confident guidance rowing past shouty marshalls and stray boats in the middle of the river. The scene looks strangely familiar and different at the same time, like in a dream - a tow path along the right-hand side with runners and dog walkers (but no fishermen), a river (but a bit wider, and pebbly beaches instead of grassy corners), houses on the left-hand side (but a bit grander), bridges (but wider and higher)... Maybe I was dosing off after all after a sleepless night. Finally, a nice and wide spin (instead of a three-point turn) and we're racing! Thinking about it now, the race went for me in a flash. I remember saying to myself, "It'll be over in 20 minutes or so", and concentrating for the rest of the time with not much room for reflection. Oh yes, there were a couple of events along the way to keep us entertained: we worked hard to hold off an overtaking boat for some time, we tried to sort out the balance by applying various strategies, we welcomed the cheers from the Hammersmith Bridge, then I didn't respond as I should have to the "mind the blades on bow side" call and hit a buoy at full speed, which was swiftly followed by a slight collision with the blades of the boat we were trying to overtake. The incident cost us some time and probably a few places, but we recovered and managed to go ahead of that boat, and then we were very pleased to hear "the last 500 meters" soon afterwards. Another boat was gaining on us towards the end, which gave us an extra incentive to push harder and I think we did manage not to let them overtake us (just about!) at the finish. The row back was long but I was still too excited to feel the tiredness. The life on the banks was busy and I enjoyed taking it all in when it was our pair's turn to have a rest. We landed on the beach (which again appeared easier than expected) and then went through the same boat-carrying process in reverse to complete our mission. I think we all had a feeling of achievement in the end - all the months of training, hours of preparations, waiting and anxiety were well worth it! PS And the hardest part of the day was cycling back home from the train station. A brief holding page to say that the Head of the Cam 2018 will be held on Saturday April the 28th 2018. Please see headofthecam.org for further details. For the first time in ages - perhaps in ever - it will not be a BR event, though we'll do our best to accomodate off-Cam crews.